Only bylaw-approved garbage cans are collected by refuse collectors. Weight of the garbage can and the contents must not exceed 20 kg (44 lbs). Residents who set out their waste in oversized, non-bylaw compliant cans could face a $60 fine. Why are oversize containers a problem? SAFETY – Containers larger than 100 litres increase the risk of injury to collectors. Such cans easily hold more than the allowed 20 kg (44 lbs), making it unsafe for collectors to handle. Movable handles make the grip on a full can less sure. Can I use garbage bags instead of a garbage container? Yes. Use garbage bags capable of holding up to 20 kg (44 lbs) of contents when lifted. They should be no smaller than 60 litres or larger than 130 litres in capacity. Please do not place waste out in plastic grocery bags. Put them in a larger garbage bag for collection. 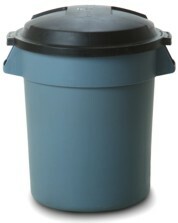 Can I use my oversize garbage can to store my waste? Yes. Please use it only to transport bags to the curb or lane. Leave the bagged garbage for collection and return the oversize garbage can for storage. There is a yellow sticker on my can. What now? Continued use of an non bylaw-compliant can with a yellow sticker affixed to it may result in a $60 fine.